Most of the time party conference season comes and goes without making a truly lasting impression on the electorate. Once the five-minute standing ovations and dramatic headlines have faded away politics normally returns to business as usual. However, on just a few occasions what takes place at a party conference or more accurately what happens in just a fleeting moment of a leader’s speech can define and shape the political narrative for years to come. Neil Kinnock lambasting the chaos of the Militant Liverpool councillors in Bournemouth in 1985 and Tony Blair heralding New Labour’s economic competency and electoral superiority on the same stage just 14 years later. David Cameron’s barn storming performance without notes in 2007 in Blackpool which dissuaded Gordon Brown from calling the infamous snap election that never was, contrasted with Theresa May’s spluttering, shambolic performance in Manchester 10 years later following the infamous snap election she wished she’d never called. These party conference speeches echo down the years, they shape our politics long after the applause has stopped and the impression they leave transcends their political moment. It is hard to tell right now whether the 2018 conference season has produced one of these totemic moments. As Brexit reaches its final stage one feels that the momentous events of the next few months may ultimately overshadow any policies or speeches that came out of the last two weeks. Certainly, the Liberal Democrat’s conference was fully focused on making a united case against Brexit and for a so called ‘Peoples Vote’. However, as both main party leaders face huge division within their own parties on Brexit they have tried to achieve unity by articulating policies and visions that go beyond March 2019 and offer a vision of Britain’s future after Brexit. Housing, how it is delivered, where it is built and who it is built for was one of the talking points of both conferences. The housing crisis is universally recognised as one of the great challenges facing Britain over the next 20 years and perhaps to the extent that this conference season is remembered it will be remembered for how both main parties gave us a glimpse of their long-term policies on how they will deal with the housing crisis. It is certainly fair to say that few issues demonstrate more clearly how differently the two main parties view the world and Britain’s future. It is possible that once the dust has settled on Brexit these contrasting visions will be the lasting impression of this conference season. The Labour conference offered radical solutions to what they call the ‘Tory housing crisis’. Shadow Housing Secretary John Healey unveiled plans for a levy on holiday homes that would raise £560 million which would then be spent on providing homes for the homelessness. This redistributive policy is an attempt to bridge the gap between the housing ‘haves’ and the housing ‘have nots’. Labour will also ‘redefine the word affordable’ by building one million council and housing association homes at one third of local incomes for first time buyers according to Shadow Housing Minister Melanie Onn. Labour also announced a new renter’s union which would allow renters to ‘organise and defend their rights’ in the face of unscrupulous landlords. These proposed reforms are radical and would represent a departure from the governments housing policy. However, they must be seen in the context of the Corbyn led Labour Party’s desire to completely remake the British economy. This conference demonstrated again what has been clear since Corbyn’s second leadership election victory in 2016; that the Labour Party is increasingly uniting behind Corbyn’s vision of an economy which is run in a way that bears little resemblance to the post 1979 consensus. Surely, then the housing reforms articulated at this conference are just the starting point rather than the culmination of Labour’s reforming zeal when it comes to housing. The Prime Minister on the other hand spent much of her speech trying to cast herself as a moderate in all things. The message was clear: Corbyn to the left of me, Boris to my right. She clearly has not lost faith in the view that elections are won in the centre ground. In a clear attempt to tac to the left and take up some of the space in the political centre vacated by Jeremy Corbyn’s Labour she announced an end to the cap on how much councils can borrow to build new homes. This is something the Local Government Association (LGA) has been calling for and was met with praise from local authorities in all parts of the country. It is thought the policy will loosen the grip of private developers and allow councils to build homes on a much greater scale as they did in the 1970s. It is a measure that is intended to alleviate the housing crisis and address the anger it has caused. It is part of the message that Theresa May wanted to ring out from her speech: austerity is over. 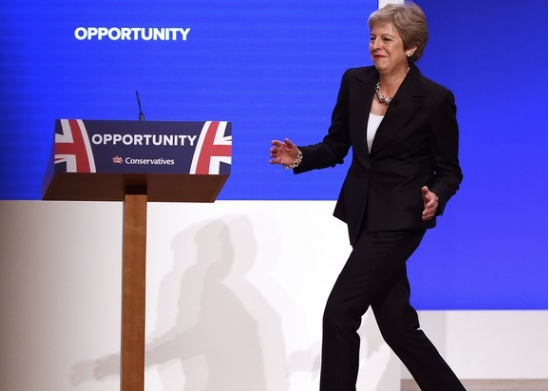 This party conference season may well be remembered for Theresa May’s ‘Dancing Queen’ routine more than anything else. However, on the issue of housing both parties set out their stall and their policies reflected their wider messages. Labour articulated radical policies; redistribution from second home owners to the homeless and one million ‘truly affordable’ homes. These reflect Labour’s wider desire to reimagine the British economy and put their values of equality and collectivism at the centre of it. Theresa May it seems is seeking to occupy the centre ground. She has abandoned the cap on council’s borrowing to build new homes in an attempt to draw a line under eight years of austerity and present herself as the person with the moderate and pragmatic solutions to the housing crisis, unconstrained by ideology. We will have to wait to see which vision is more persuasive to the British public but one imagines that once the dust has settled on Brexit it is the contrasting visions of the future put forward at this conference season that will decide the next general election.